The 10 Best Caterers in Vermont! With a variety of cuisine served up across the state, it’s no surprise Vermont is home to some of the best catering around. Whether you’re looking for French classics, flavorful Italian, or traditional American dishes, Vermont’s best caterers are going to make your next event top-notch. Here are the 10 best in the state! These award-winning restaurateurs are also veteran caterers, and their catering menus are designed as guidelines to begin the process of planning your event. Work with the chefs to create menus that accommodate a variety of tastes, budgets, and diets. Get catering services for weddings, parties, and special events. Bistro Henry can handle events with even the strictest of details. No matter what the occasion is, you can count on the Phat Italian to come through. Whether it is catering for corporate events, weddings, parties, or banquets & conventions, there is nothing like Italian food to bring people together—we are talking rigatoni, ravioli, eggplant parmesan, chicken marsala, veal saltimbocca, cannoli, and more. 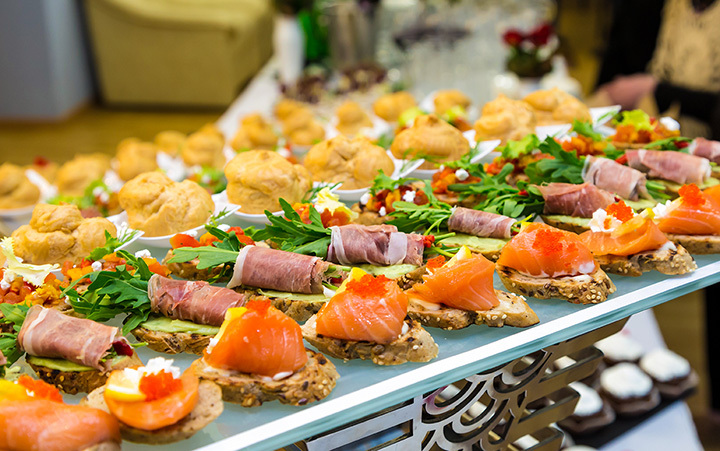 So, when it comes to catering, come on—forget about it! Operating a mobile food truck that can satisfy any event, Corner Stone knows a thing or two about burgers and Vermont craft beer. Featuring a duck burger, a kimchi burger, a mac and cheese burger, and their own from scratch fried chicken, the food is good old down home stick to your ribs good. So get burgers and beer for your event. Cloud 9 today is known for providing eclectic, contemporary, and fresh food. As a member of the Vermont Fresh Network, they are committed to delivering locally sourced, organic food whenever possible. Food is their passion at Cloud 9, and they offer services for every occasion. From fried oysters to duck confit, Cloud 9 has got you covered. Offering lunch, dinner, and bakery items for any occasion, the Vermont Country Deli will cater the event, or they can prepare all the event food for pick up. Appetizer menus include smoked salmon and trout, crab stuffed deviled eggs, quiche, meatballs, and more. For lunch, you can get potato encrusted cod, pork pot stickers, custom sandwiches, and more. Dinner covers all of the basics—pork, chicken, seafood, and beef, and bakery offers a separate menu as well. Are you a fan of flat bread, wood-fired pizza? Who isn’t? So if you are in need of a mobile pizza oven in the Montpelier area, there is only one place to call. Woodbelly emanates warmth from a glowing hearth on wheels, and the crackling of burning wood draws you close as the aromas of crispy dough and melting cheese waft through the air. The basic service includes pizza and salad made from local ingredients. The Dutch Mill Family Restaurant is known for home-style breakfasts and lunch, but they also have a kicked up catering service that includes use of their pool, motel, and camping area. Family owned and operated since 1968, the catering menu consists of smoked and rotisserie meats cooked on their mobile grill. They will also pack up their entire breakfast menu to go for your special event. Whether you are planning a business meeting or an office party, catering by New Moon is built on a reputation of great food and even better coffee. All recipes are original and cooked from scratch. Their menu, much of it available for catering, offers food that accommodates locavores, vegans, and gluten-free eaters, though they bake their our own pastries, cupcakes, bagels and bread every day. All food is all-natural, with no dyes and no preservatives so for breakfast and lunch catering, there’s a new moon on the rise. This small, eclectic cafe in the Northeast Kingdom of Vermont serves fresh, local food made from seasonal ingredients. Check out a catering menu that includes chicken saltimbocca with fresh sage prosciutto and white wine or grilled hanger steak, pepper crusted with a mushroom marsala sauce. And that is just for starters because you can choose from apps, seafood, vegetarian dishes, and more. If you love the Skinny Pancake—the from-scratch breakfast sandwiches, the burritos, the fried cheese curd, the pizza crepes, the paninis, and more—you have got to check out Have Your Cake Catering. Not only do they provide personalized service and delicious local, fresh food, they can also take care of all of your party needs starting at $2.50 per person.